A) Standing warrior, leaning on his shield; 180 x 113 mm. B) Sketch for a composition; 113 x 180 mm. Both the drawings in pen and brown ink, both inscribed (signed?) Le Brun. In all likelihood, both drawings come from the same sketchbook. A pupil of the sculptor Pigalle, André Le Brun came to Rome in 1756 and settled there as a student of the French Academy. His sculptural works gained the recognition of Roman Society. His success, together with Pigalle's high praise, justified Madame Geoffrin's recommendation of the artist to Stanislas Augustus, king of Poland. On receiving the royal invitation, Le Brun went to Warsaw in 1768 and became court sculptor and a favorite with the king. After a few years work for the Royal Palace, he was sent back to Rome by Stanislas Augustus in order to perfect his style through the study of antique sculpture. On his return to Warsaw in 1779 Le Brun worked at the decoration of the country palace of Lazienki. In 1808 Le Brun was appointed professor at the University of Vilna and remained at this post until his death. 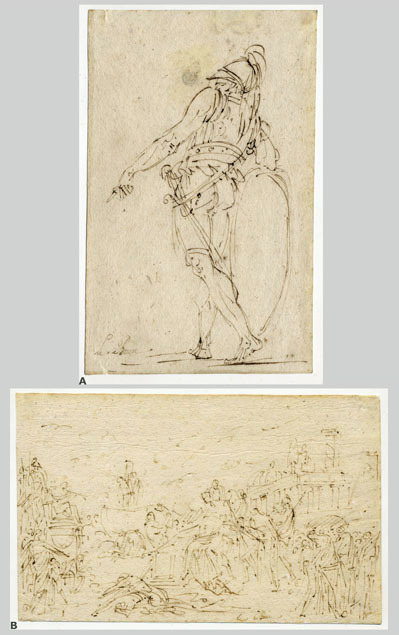 Drawing occupied a major place in Le Brun's artistic activity, and his graphic works are frequently found in Polish an Russian collections. See M. V. Dobroklonsky, Drawings by André Le Brun in the Hermitage, in Master Drawings, vol. II, number 4, 1964, pp. 407-409.